The Kona Crime Prevention Committee named Officer Erich Jackson "Officer of the Year" in a luncheon ceremony Wednesday (September 17) at King Kamehameha’s Kona Beach Hotel. The committee had already recognized Jackson twice this year for his excellent police work. 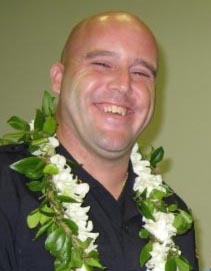 Jackson was named "Officer of the Month" in February for his work in recovering drugs and stolen property during an investigation of a suspicious vehicle on Kuakini Highway. Jackson’s investigation led to the arrest of the driver, who was on parole and had just given methamphetamine to his 16-year-old passenger. Jackson was named "Officer of the Month" again in June for his efforts in the recovery of methamphetamine and the arrest of two meth traffickers. Recovered money was determined to be proceeds from illegal drug transactions. It was seized and forfeited. One man’s bail was set at $95,000 and the other’s at $40,000.